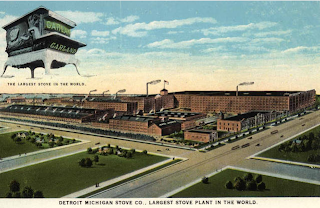 In the last part of the 19th century, Detroit was the hub of the American cookstove industry. This was documented at the 1893 World's Colombian Exposition, where a Garland stove made of oak loomed large. Measuring 25 feet tall, 30 feet long and 25 feet wide, the colossal cooker [which, contrary to this postcard image, was distinctly earthbound] has survived, in various locations, to this day. However, with future of the Michigan State Fairgrounds [its current home] now up in the air, the fate of the range is uncertain. Well, it's not Violet-le-Duc restoring Notre Dame, but I guess you preserve what you've got. Also, it looks like it might actually be the stove that ate Chicago. I'm glad it wasn't a Radarange.